I think it encapsulates so much about post Black Death religion in Norfolk. I will quote it often! This font base was recently rescued from the church of Holy Trinity, Hautbois before the redundant church was handed over to the Guides as an extra building for their Hautbois Activities Centre. Early C12 font base, supporting C19 square bawl. Base carved with entwined winged serpents, divided from the foliated base section by double keel moulding. I imagine bawl is a typo. 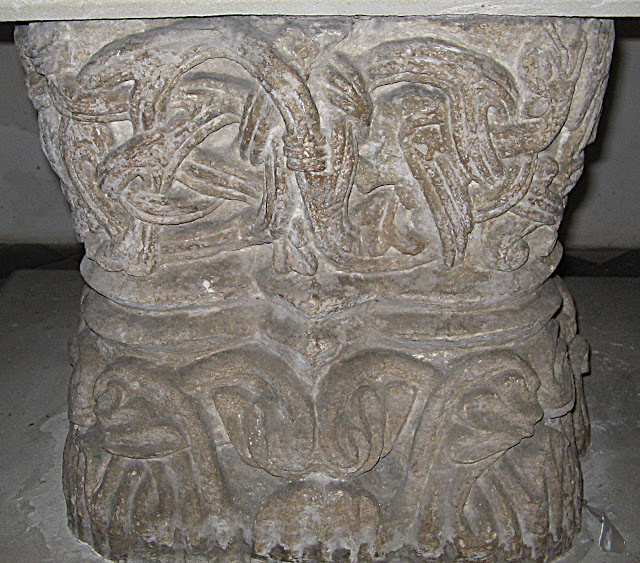 What they do not say, although this is true The square 19th Century bowl plunked on top of a wonderful 12th C font base, which still appears to have some of red pigment on the winged serpents, is hideous!